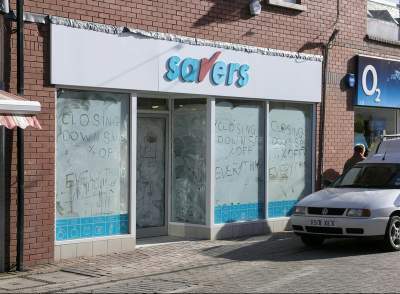 Businesses in Limavady change at an ever-increasing rate. Some old firms - like Lockheads - are closing down, others open up with great melodious fanfares and close down with a whimper before one even remembers what they were trying to sell and no doubt there are some who close before they get around actually to open. Add to that the confusing habit of moving your premises to a new address every once in a while and it is no wonder that Limavady shoppers often look confused. 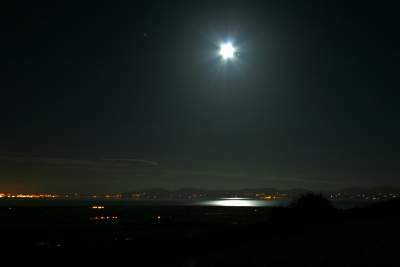 We couldn't resist publishing this photograph of the moon over Lough Foyle. Sharp eyed viewers may even spot the planet Saturn to the right of Luna, which it has just skimmed by. The excuse for showing this splendid photograph is to remind our astronomically minded readers that there will be a lunar eclipse starting at around 9:30 pm on the 3rd of this month. The night of the eclipse was a spectacular night. For once there wasn't a cloud to be seen, the air was clear and the moon performed like a star! The show lasted till after one o'clock. The compound photograph on the right shows those who missed it what they missed. The sequence starts on the bottom left and ends at the top right. The coloured phase was the moon during totality. 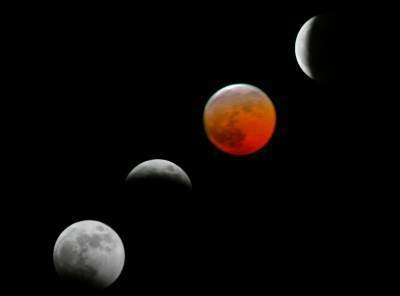 It was one of the most memorable lunar eclipses for years. Many readers of the Newsbrowser are interested in astronomy, so here is a link to a larger version of the photograph. A bit of a joke? Seasoned readers of this amazing publication will know that our editor is always on the lookout for informative signs which - for one reason or another (or possibly both) - somehow manage to miss the point entirely. Occasionally the joke becomes apparent only when two cleverly designed notices are placed side by side. 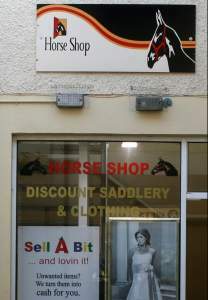 Either: The horse shop sells everything you need for your mount except bits - you have to go next door for one of those. 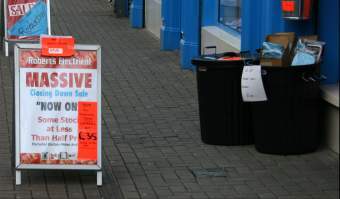 Or: As soon as you buy a bit in one shop, you can sell it in the other shop for a fat profit. Possibly: They did this deliberately in order to get into the NewsBrowser. Readers who would like to peruse all the other silly signs should follow this link. People familiar with this little town will be surprised to hear that Robert - who has had more sensational sales than anybody else in this town - has decided to have a definitely final, never-to-be-repeated sensational last sellout and then concentrate on retirement. Soon there won't be a familiar face left in the centre of town no matter how hard you look. We shall miss your advertising, Robert.